However the scientific community receives Dr. Berger’s latest analyses, the media headlines have already voted sediba another dose of public acclaim. Paleoanthropologist Lee Berger has been capturing headlines since the fateful day in 2008 when he (or actually his little boy) found the first Australopithecus sediba fossil at Malapa. Malapa Cave is north of Johannesburg and now consists of collapsed pits. Excavation has yielded fossils of an adult female, “a boy estimated to be 11 or 12 years old,”1 and an infant. The overriding problem to be confronted if Australopithecus sediba was to receive recognition as the real transitional ancestor to Homo was its age. At 1.78–1.95 million years old (Ma), Australopithecus sediba was just “too young to be considered an ancestor of Homo.”5 Those original dates were derived from a combination of “faunal correlation, U-Pb dating, and paleomagnetic data.”6 In order to take its place on Homo’s ancestral throne, Au. sediba must age. First, a reachable age goal had to be set. Then, the fossils needed to be re-dated to conform to expectations. Both missions were accomplished and duly reported with apparent phenomenal precision. The first task was to identify the “the earliest uncontested evidence for Homo in Africa.”7 Although some of the other articles reported comparisons to Homo habilis, both H. habilis and H. rudolfensis were rejected in favor of the earliest commonly accepted member, Homo erectus. It was necessary however to dispense with one particularly inconvenient Homo fossil, a fairly modern-looking maxilla from the Hadar region of Ethiopia, A.L. 666-1, because it carries a date of 2.33 Ma, pre-dating (by evolutionary reckoning) any revised date possible for Au. sediba. Berger’s team explains, however, that “While the specimen does indeed align with fossils attributed to Homo, it does not do so to the exclusion of australopiths.”8 In other words, A.L. 666-1 might not really be Homo because it is sort of a mosaic of features, including some seen in australopithecines. Having rejected A.L. 666-1’s bid to be the earliest undisputed Homo, Berger may find the displaced jaw returning next year to challenge his sediba’s place for the oldest mosaic ancestor! Having eliminated the inconveniently old jaw from competition, Berger’s sediba only had to prove to be older than 1.90 Ma. This target date was settled on the basis of Homo erectus fossils from Koobi Fora, Swartkans, and Dmansi, which collectively date in the 1.78–1.90 Ma range. Aging sediba would require some careful manipulation of data, since the original U-Pb dating of the flowstone beneath the fossils effectively set a limit of 2.026 +/- 0.021 (2.05-2.01) Ma as the oldest possible age. Having bracketed the hominin fossils below and above—well, sort of, since the hominin-bearing sediment is not observed as being physically between these two flowstone layers—and having noted that both flowstone layers had reversed paleomagnetic signatures, the Au. sediba fossils in sediment of normal polarity could be “tightly constrained” to 1.977 +/- 0.002 Ma. This date was settled upon by comparison with the apparently very similar paleomagnetic pattern in the Huckleberry Ridge Tuff (volcanic rock) in Yellowstone Park. The nice 3000 year window was possible because the time of varying polarity in the earth’s magnetic field was presumed—based on evolutionary correlations and assumptions—to be very brief. The precision dates are attractive, as precision has much appeal, but their reliability is something of an illusion. The date was obtained by comparison to the Huckleberry Ridge Tuff, which was itself dated using argon-argon dating. Argon-argon dating is calibrated by analyzing the sample with standard specimens of “known” ages. But those “known” standard ages are established using other radiometric data (which have their own documented problems14 ). Thus, the whole process is quite circular, producing an attractive “precise” date of completely unknown accuracy. Nevertheless, having secured a date just a little older than the oldest uncontested Homo specimen (by conveniently massaging the very scattered analytical data to obtain the desired result), Berger’s team could tackle the anatomical issues haunting the fossil pair and build a case for a marvelously mosaic transitional form. The male fossil of Malapa is a “boy” of very little brain and a particularly ape-like visage. (His female companion is headless.) Despite the assertion that his “nasal bones are elevated as a prominent ridge at the internasal suture, with an increasingly anterior projection inferiorly,”15 one look at a photograph (see below) shows the fellow could have never worn glasses. There is no genuine prominence of the nasal bones, only a tiny ridge formed where bones meet. The skull also has the sloping face with a flat forehead and the eyes-front orbits typical of apes. The skull’s shape wasn’t the only problem with the near-ancestral claim. At an age estimated to have achieved adult brain size, the “boy’s” cranial capacity was only 420 cc. (Normal human cranial capacity is 700-2200 cc.17 The smallest disputed Homo head size is much larger at 510 cc.18) Therefore, using synchrotron-based imaging technology, Berger’s team obtained a 3D virtual endocast19 of the “boy’s” brain, hoping he had more evolving inside than out. The virtual brain combined “australopithecine-like convolutional patterns” with “some foreshadowing of features of the human frontal lobes.”21 The endocast was compared with two Australopithecus africanus specimens and chimpanzees. The first of the “foreshadowed” developments was a slight asymmetry of the brain. The right frontal lobe appeared a little larger than the left. However, this feature is not unique to humans. “Such visually apparent (qualitative) right frontal petalias [single-sided prominences] are observed in non-human primates but at a much lower frequency than in humans.”22 Apparently, both this finding and the information with which it is compared are subjective, not quantitative, observations. Furthermore, these subtle observations about slight asymmetry and distinctive dimensions may well have been affected by distortion of the brain. Much of the skull was missing—and so of course was the underlying endocast. Moreover, the authors wrote, “Postmortem medial displacement of the right temporal pole appears likely, accompanied by inward displacement of the right posterior inferior frontal lobe.”26 Even though they stated, “Neither displacement appears accompanied by visible distortion or warping of relative proportions in these areas,”27 the simple fact is the skull appeared to have been crushed. It is hard to believe this head trauma did not affect the dimensional measurements and the subjective observations of sizes and shapes. Despite the acclaimed foreshadowing of the human brain, the authors admitted, “Critically, however, there are no frontal lobe characteristics that we identified grouping endocasts of modern humans and other australopiths to the exclusion of the MH1 endocast.”28 For instance, the temporal poles of MH1’s endocast were “anteriorly expanded”29 but matched the other australopithecine endocasts. And the temporal poles of MH1 seemed to be oriented less laterally than the other australopithecine’s but matched “modern humans and chimpanzees.”30 In other words, there really wasn’t anything all that unique or special about the “boy’s” little brain. 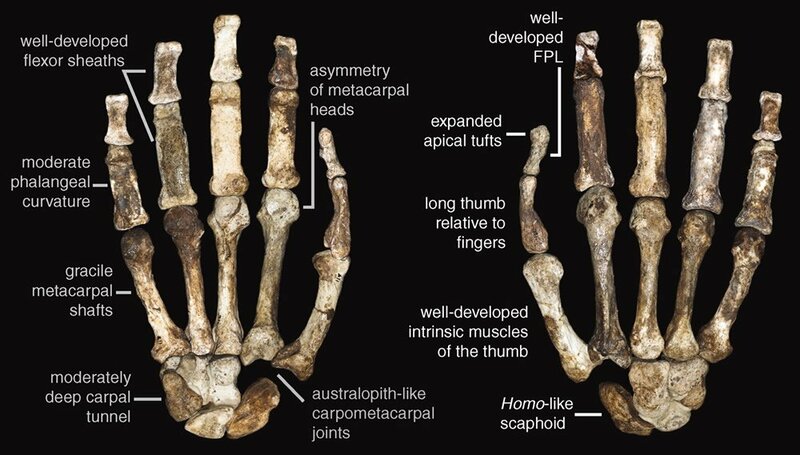 Analysis of the adult female fossil’s skeletal right hand (minus a few wrist bones and the tips of her fingers)32 seems to suggest to Berger’s team that MH2 lived in the best of both worlds. “A suite of Australopithecus-like features”33 like strong flexor muscles and “phalangeal curvature [curved fingers],”34 along with her long arms and “cranially oriented glenoid fossa [upward pointing shoulder socket]”35 equipped her to swing through the trees. But they believe her “Homo-like features, such as a long thumb and short fingers [were] associated with precision gripping and possible stone tool production.”36 Stone tools of the simple Oldowan variety appeared—according to evolutionary timetables—2.6 million years ago. The only known fossil hominin believed old enough to have used them is Homo habilis. Therefore, despite H. habilis’s rejection as an index fossil in the dating revision, it is the fossil of choice for hand analysis. No tools have been found at the Malapa site. The question is, “Could MH2 have made and used them?” Evolutionary paleoanthropologists wish to understand not just the evolution of hand anatomy but the evolution of hand function—of tool use and tool production. With no tool in her grip, MH2 guards her secrets and leaves her appraisers guessing what her bones could have been capable of and assuming that’s what she did. In truth, while we can make educated guesses about the ways certain joints could have moved and what limitations may have been present, we cannot know how a hand was used. Thus, features described as derived morphology evolving toward a Homo hand are noted to be useful for either climbing or tool-making. For example, the “robust” base of the fifth metacarpal where the flexor ulnaris muscle would insert is noted to be important in climbing and tool-making.37 The pad of the thumb is thought to be thick and human-like due to the length of the thumb and an indentation of the palm to accommodate a generous muscle. “Such a palmar pad could have helped the thumb accommodate objects during firm precision grips.”38 Yet this same feature is found in other “primitive” hominins and thought to have “convergently developed in multiple hominin taxa for tool-making and non-tool-making behaviors.”39 And to confuse the evolutionary picture further, Homo habilis does not possess most of these humanizing features, requiring reverse evolution for that hominin to keep its ancestral spot. When considering hominin evolution, paleoanthropologists consider the pelvis to be of supreme importance for two reasons: the pelvic role in bipedalism and the survival advantage of easily birthing the evolving enlarging head. Although Au. sediba’s small head precluded the need for a humanizing trend in its pelvic shape, the reconstructed Au. sediba pelvises seemed to have a more human-like pelvic inlet than other apes. The researchers deemed it a bit more “gynacoid”43 than Au. afarensis and Au. africanus but less so than the Gona H. erectus pelvis and the pelvis of modern humans. While the researchers describe these features, a look at the photographs reveals the potential for a great deal of observer bias. The pelvic features necessary for bipedal locomotion are those depicted in gray. In other words, those features are those which have been reconstructed. The actual pelvic pieces do not contain the relevant parts. Thus, to conclude that these Au. sediba pelvises prove bipedality would be insupportable. And to the researchers’ credit, they do not draw that conclusion on the basis of the pelvic fossils, in spite of the very human appearance of their reconstructions. The specimens dug from Malapa consist primarily of the larger bones of MH2’s ankle: a partial distal tibia (shin bone), talus (the large bone beneath the tibia), and the calcaneus (heel bone). “These fossils were found in articulation and remain imprisoned in the matrix.”49 This unit is the only one like it in the hominin fossil record. The individual bones and their articulations were examined indirectly by digitally constructing 3D images50 from a CT scan. The constellation of human-like features the Berger team believes diagnostic of bipedalism are an arched foot, an Achilles tendon, and an ankle joint angled to indicate the ankle’s owner had a valgus angle. The existence of an Achilles tendon was suggested by the possible presence of some bony fibers at the attachment site on the heel bone. However, Achilles tendons are not unique to humans; ape Achilles’ tendons are just smaller. Why the priority to have an arched foot? Beyond the need of the arch to show bipedalism, the arch is needed because the famous Laetoli footprints54 in Tanzania have an arch. Despite the obvious human shape to the famous footprints, most evolutionists persist in assigning them to Lucy, the famous Au. afarensis found in Ethiopia. If Au. sediba is to vie for a position closer to Homo than Lucy’s, it must have arched feet. Thus, observer bias demands the researchers see evidence for a longitudinal arch. Finally, “the most important [feature] from a functional standpoint”55 is that the tibial joint surface is angled so as to position “the knee over the foot [which] may be indirectly related to the presence of a valgus knee.”56 The geometry of this anatomical arrangement angles the knee medially to make the weight-bearing tibia stand directly above the ankle. While the valgus angle is essential to efficient and stable bipedalism, it is not limited to humans. In fact, spider monkeys and orangutans have a similar valgus angle, and it serves them well as they walk along tree branches. After thus building a case, the Berger team definitively states, “Au. sediba is clearly bipedal.”57 However, not only are there problems with each of their key points, no individual feature is sufficient for bipedalism. Bipedality is a product of many factors working together, with the correct parts in the correct arrangement from the back to the foot. Thus a mosaic of features cannot be diagnostic of bipedality, and each of the features individually fails to offer a survival advantage to preserve it in the evolutionary process. The whole evolutionary scenario gets even more confusing for the Berger team when they compare their Au. sediba foot to Au. afarensis. The features become so confusing the authors invoke convergent evolution—the classic solution when ancestral development fails to explain similar features—as well as evolutionary reversals to explain the loss of advancing features. The authors conclude that foot evolution to acquire bipedality is far more complex than anyone previously thought. They are unable to draw phylogenetic conclusions about sequential evolutionary development because there was no sequential evolutionary development. Each created kind of creature and each surviving variation within each kind had a constellation of features that worked together and equipped it for life in its niche. The phrase “sleight of hand” in the title of this article is not intended to imply dishonesty on any scientist’s part. The observable facts of science are always interpreted in accordance with the presuppositions of the scientist. Creationists and evolutionists all have the same set of facts before them. Each will necessarily see those facts within the frame of what they believe must be true. Evolutionists are committed to the idea that organisms have changed into more complex kinds of organisms over millions of years. Believing this with heartfelt conviction, they must interpret data in such a way as to search for those transitions. They must connect the dots. Creationists believe God’s eyewitness account of Creation and believe that God created distinct kinds of organisms with the capacity to diversify within the created kind. Because we see no need to place the fossils on a sequential timeline, we see that they can often be grouped together as created kinds with variation within those kinds. Thus, the australopithecines may well be an extinct created kind of ape. The features discovered on various australopithecine fossils describe several varieties of this created kind. We are not surprised to find some similarities between different kinds of creatures. There are certainly obvious similarities between humans and the apes in the zoo and the australopithecine fossils. However, the urgent desire to prove ancestry may prompt some observers to see more similarities than truly exist and to personify those fossils with functions (like tool making). But function cannot be fossilized. And similarity need not imply ancestry. It doesn’t—unless you are convinced it must. Then the imagination is able to take over and connect the dots, creating transitional forms when there really were no transitions at all. Previous Article Jewish Scientists Who Oppose Darwinism Next Article Is the Wood Recently Found on Mt. Ararat from the Ark? Michal Balter, “Candidate Human Ancestor From South Africa Sparks Praise and Debate” (Science 328, no. 5975 [April 9, 2010]: 154–155, doi:10.1126/science.328.5975.154), 154. 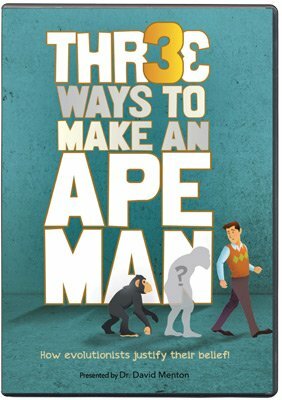 See Marvin Lubenow, “The Problem with Australopithecus sediba,” Answers in Depth 5 (August 11, 2010), https://answersingenesis.org/human-evolution/australopithecus-sediba/the-problem-with-australopithecus-sediba/; and David Dewitt, Anne Habermehl, and Dr. David Menton, “Baraminological Analysis Places Homo habilis, Homo rudolfensis, and Australopithecus sediba in the Human Holobaramin: Discussion,” Answers Research Journal 3 (August 25, 2010): 153–158, https://answersingenesis.org/creation-science/baraminology/homo-habilis-homo-rudolfensis-australopithecus-sediba-discussion/. See Elizabeth Mitchell, “New African Fossils Alter Perception of Human Origins,” Answers in Genesis, September 10, 2011, https://answersingenesis.org/fossils/transitional-fossils/african-fossils-alter-perception-human-origins/. Michael Balter, “Paleoanthropologist Now Rides High On a New Fossil Tide” (Science 333, no. 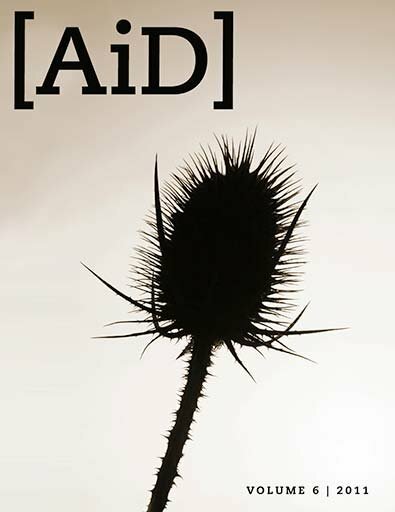 6048 [September 9, 2011]: 1373–1375, doi:10.1126/science.333.6048.1373), 1373. Robyn Pickering et al., “Australopithecus sediba at 1.977 Ma and Implications for the Origins of the Genus Homo” (Science 333, no. 6048 [September 9, 2011]: 1421–1423, doi:10.1126/science.1203697), 1421. Robyn Pickering et al., “Supporting Online Material for Australopithecus sediba at 1.977 Ma and Implications for the Origins of the Genus Homo” (Science 333, no. 1421 [September 9, 2011]: http://science.sciencemag.org/content/sci/suppl/2011/09/08/science.1203697.DC1/Pickering-SOM.pdf), 6. Paul H. G. M. Dirks et al., “Geological Setting and Age of Australopithecus sediba (Science 328, no. 5975 [April 9, 2010]: 205–208, doi:10.1126/science.1184950), 205. Pickering et al., “Supporting Online Material for Australopithecus sediba at 1.977 Ma and Implications for the Origins of the Genus Homo,” 16. For example, Alan P. Dickin, Radiogenic Isotope Geology (Cambridge, UK: Cambridge University Press, 1995), 34–36; and Kenneth R. Ludwig, Isoplot/Ex: A Geochronological Toolkit for Microsoft Excel (rev. 2.49, Berkeley Geochronology Center, CA, 2001), 18. The latter software was used by Pickering, the author of this study, to derive his age and MSWD from the analytical data, so he isn’t even obeying the rules for interpretative use of this software. Gunter Faure and Teresa M. Mensing, Isotopes: Principles and Applications, third ed., Hoboken, New Jersey:John Wiley and Sons, 2005. Alan P. Dickin, Radiogenic Isotope Geology, second ed., Cambridge, UK and New York, NY: Cambridge University Press, 2005. Andrew A. Snelling, “Geochemical Processes in the Mantle and Crust,” in Radioisotopes and the Age of the Earth: A Young-Earth Creationist Research Initiative (Larry Vardiman, Andrew A. Snelling, and E. F. Chaffin, eds., Dallas, Texas: Institute for Creation Research and Creation Research Society, 2000), 123–304. Andrew A. Snelling, “Radiometric Dating,” Answers, April 1, 2010, https://answersingenesis.org/geology/radiometric-dating/radiometric-dating/. Andrew A. Snelling, “Radiometric Dating: Problems with the Assumptions,” Answers, October 1, 2009, https://answersingenesis.org/geology/radiometric-dating/radiometric-dating-problems-with-the-assumptions/. Andrew A. Snelling, “Radiometric Dating: Making Sense of the Patterns,” Answers, January 1, 2010, https://answersingenesis.org/geology/radiometric-dating/radiometric-dating-making-sense-of-the-patterns/. 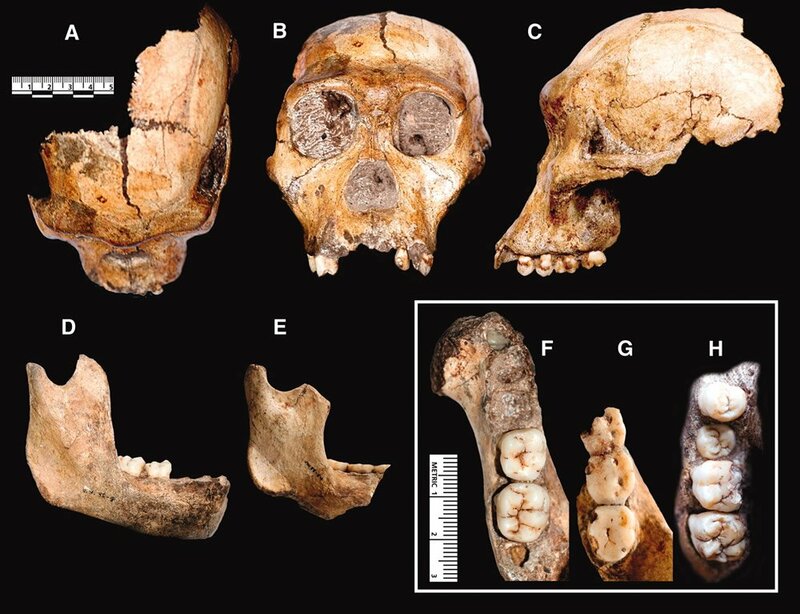 Lee R. Berger et al., “Australopithecus sediba: A New Species of Homo-like Australopith from South Africa” (Science 328, no. 5975 [April 9, 2010]: 195–204, doi:10.1126/science.1184944), 196. Marvin L. Lubenow, Bones of Contention (Grand Rapids, Michigan: Baker Books, 1992), 127–128. Balter, “Candidate Human Ancestor From South Africa Sparks Praise and Debate,” 155. Kristian J. Carlson et al., “The Endocast of MH1, Australopithecus sediba,” Science 333, no. 6048 (September 9, 2011): 1402–1407, doi:10.1126/science.1203922. Ann Gibbons, “Skeletons Present an Exquisite Paleo-puzzle,” Science 333, no. 6048 (September 9, 2011): 1370–1372, doi:10.1126/science.333.6048.1370. 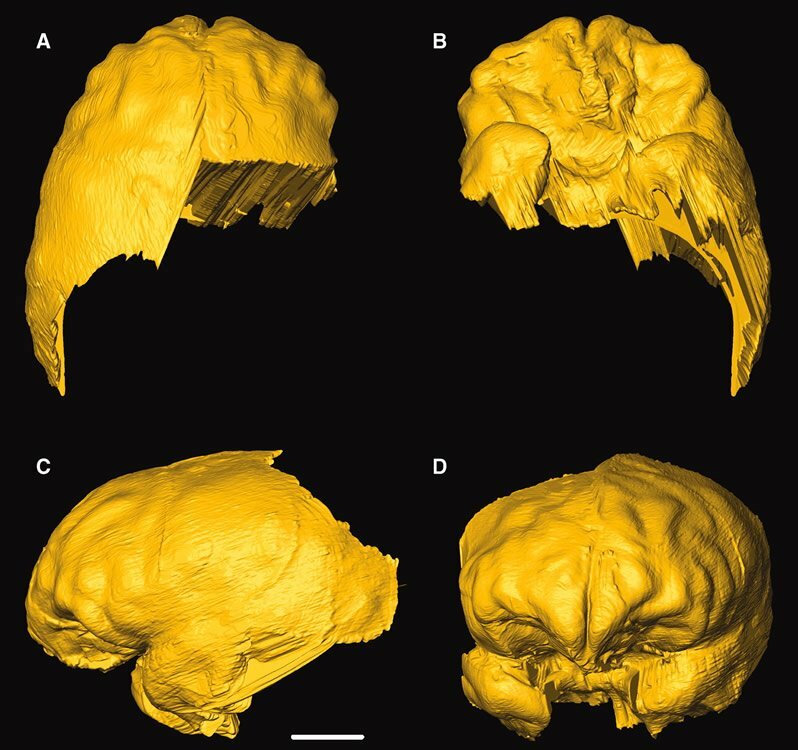 Carlson et al., “The Endocast of MH1, Australopithecus sediba. Carlson et al., “The Endocast of MH1, Australopithecus sediba,” 1406. Tracy L. Kivell et al., “Australopithecus sediba Hand Demonstrates Mosaic Evolution of Locomotor and Manipulative Abilities,” Science 333, no. 6048 (September 9, 2011): 1411–1417, doi:10.1126/science.1202625. 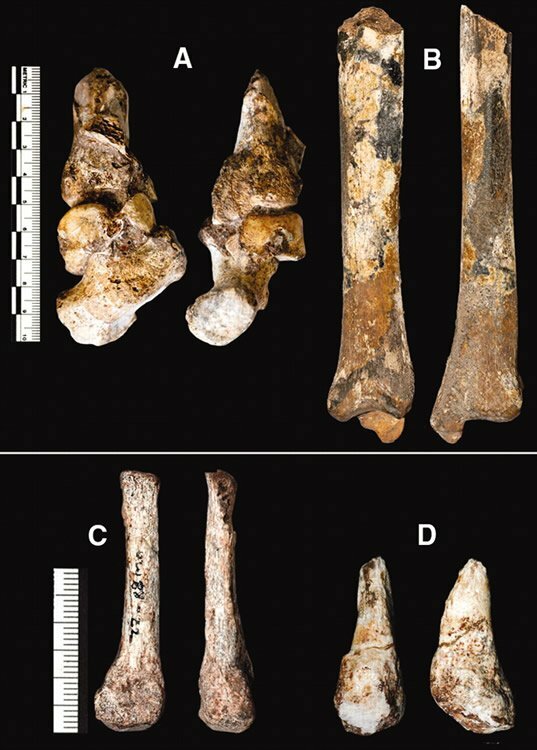 Lee R. Berger et al., “Australopithecus sediba: A New Species of Homo-like Australopith from South Africa” (Science 328, no. 5975 [April 9, 2010]: 195–204, doi:10.1126/science.1184944), 202. Gibbons, “Skeletons Present an Exquisite Paleo-puzzle,” 1371. Job M. Kibii et al., “A Partial Pelvis of Australopithecus sediba” (Science 333, no. 6048 [September 9, 2011]: 1407–1411, doi:10.1126/science.1202521), 1410. Bernhard Zipfel et al., “The Foot and Ankle of Australopithecus sediba” (Science 333, no. 6048 [September 9, 2011]: 1417–1420, doi:10.1126/science.1202703), 1417. See “Lessons from Laetoli” in David Menton, “Mexican Markings and Chronological Chaos,” Answers in Genesis, January 30, 2006, https://answersingenesis.org/geology/geologic-time-scale/mexican-markings-and-chronological-chaos/. Zipfel et al., “The Foot and Ankle of Australopithecus sediba, 1419.